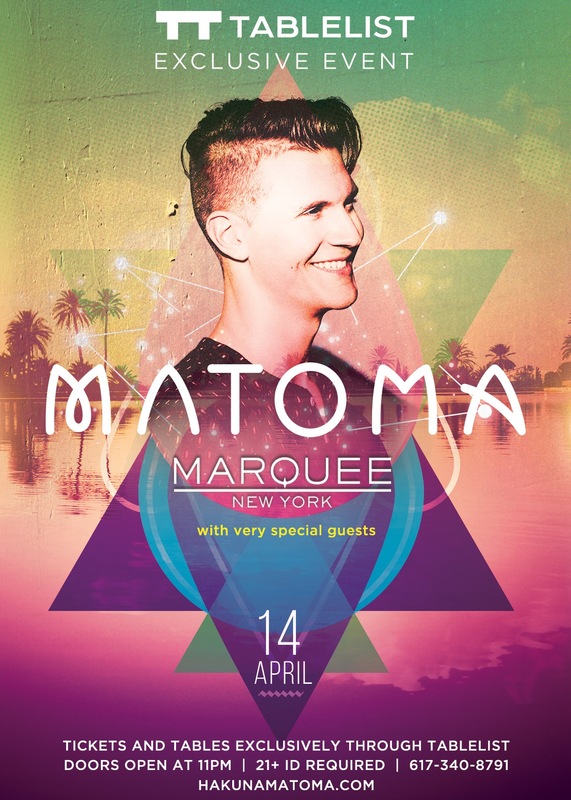 Don’t miss the chance to party with the exceptional tropical house DJ, Matoma at Marquee New York on 4/14, with special guests to be announced! Book your ticket exclusively through the Tablelist app. Show up to the venue and show them your ticket – found under the Bookings –> Admissions section of the app or via link in your confirmation email. Bring your phone with QR code, or print your booking receipt for entry to the venue. Enjoy your night out with te best seat in the house for Matoma at Marquee. Tom Lagergren – known by his stage name of Matoma – started playing the piano as a child. During that period, he won a contest to perform alongside Norwegian pianists Håvard Gimse and Leif Ove Andsnes. As he grew tired of classical piano, Lagergren began mixing on his computer. He holds a bachelors degree in Music Technology from the Norwegian University of Science and Technology. The Remix “Free Fallin Tropical Mojito Remix (John Mayer Tribute)” was produced with associated tropical-house-music-producer Nelsaan and got published at Matomas 23rd birthday. After the release of Marlon Roudette’s “When the Beat Drops Out” in July 2014 Matoma was engaged by Universal Germany to make a remix of it. “Marlon Roudette – When The Beat Drops Out (Matoma Tropical Remix)” was released in August, 2014. His remix of “Old Thing Back” by The Notorious B.I.G. became popular when it charted in Norway peaking at number two on VG-lista, the official Norwegian singles chart. It also charted highly in Sweden, Finland, Denmark and New Zealand. It reached number 1 on the music blog aggregator Hype Machine with many record companies including Big Beat Records expressing interest in Matoma’s work after hearing the remix. Ja Rule, who is featured on the original track, also tweeted that he loved the track. Stay tuned for more! Check out some of his songs on SoundCloud. No alcohol permitted on premises other than that served by the licensed vendors of this event. Credit does not apply to tickets. Entry is per doorman’s discretion. ALL TICKET SALES ARE FINAL: NO REFUNDS.